Sunflower season is upon us, that time when fields are filled with endless rows of these dear, stately flowers. 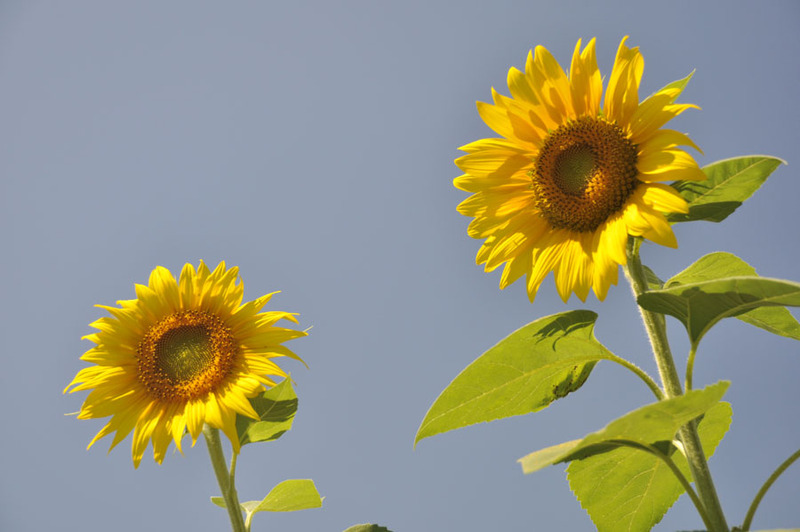 After trees, I think that sunflowers are the most anthropomorphic member of the plant kingdom: their bright yellow smiles and their spread-out leaves seem to offer a hearty “Welcome! Look at me!” to all who pass by. Thanks to a tip-off from fellow photographer G. Steve Jordan of New Paltz (more about Steve in a future blog), I found a huge field of sunflowers on Route 299 leading out of town; they were flanking a big tree that belongs in a painting by 19th-century landscape painter Asher B. Durand. Nice! An “anchor” for my photos. And the eight-feet-tall sunflowers’ welcoming qualities came into play when I hid under them during a sudden rain shower and they protected me from getting soaked! The sunflowers in the photo I’m going to show you here aren’t from the Hudson Valley, however, but from Connecticut: Buttonwood Farm in Griswold. I’ve been there several times during their annual “Sunflowers for Wishes” week in July, and I believe this photo was from my second visit. The barn wall is from a recent trip to the Delaware Water Gap with fellow members of the Ridgewood Camera Club, and so you’re looking at some artwork combining photos from Connecticut and Pennsylvania and made by a photographer in New York. Who belongs to a New Jersey camera club. Starting by ensuring that the two photos were the same size and then cloning out the rusty nails in the barn wall photo, I combined the two photos in Photoshop. 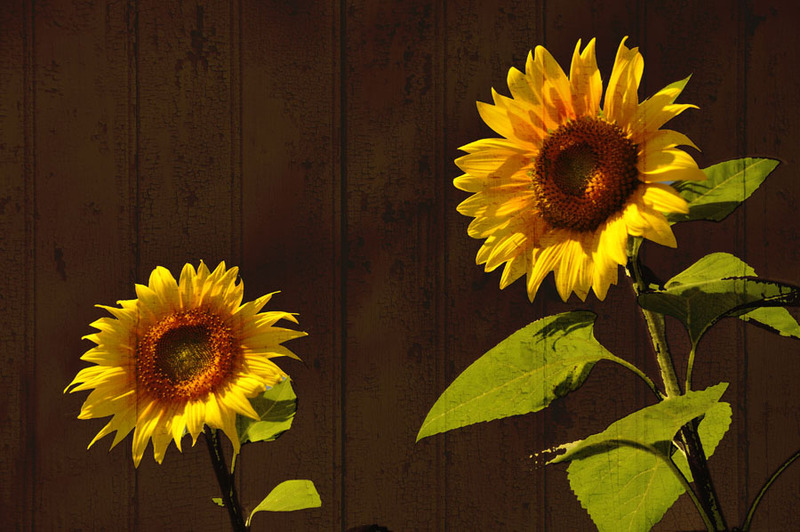 For the first one I dragged the sunflower photo over the barn wall photo. I wanted that wall to provide texture for the photo. I used the “Darken” blend mode with 100% opacity, then selected the flowers and increased the brightness. There are many different blend modes available, of course, but I preferred “Darken” because it made the end result look as if someone had long ago painted sunflowers on the wall and it was all now peeling. Finally, I applied the Color Contrast preset from Nik Color Efex Pro to make the entire picture a lot brighter. The second version gives an entirely different result. This time I began by changing the blue sky in the sunflower photo to the rich brown you see here, then I pulled the barn on top of the sunflowers. Here the blending mode was “Color burn” at 56% opacity. It gives a rather dramatic result, I think; at least two friends have commented on the “3D” effect. Regular readers of this blog will know that I love to photograph old buildings, especially old buildings that are sort of hurtling toward a state of ruin. 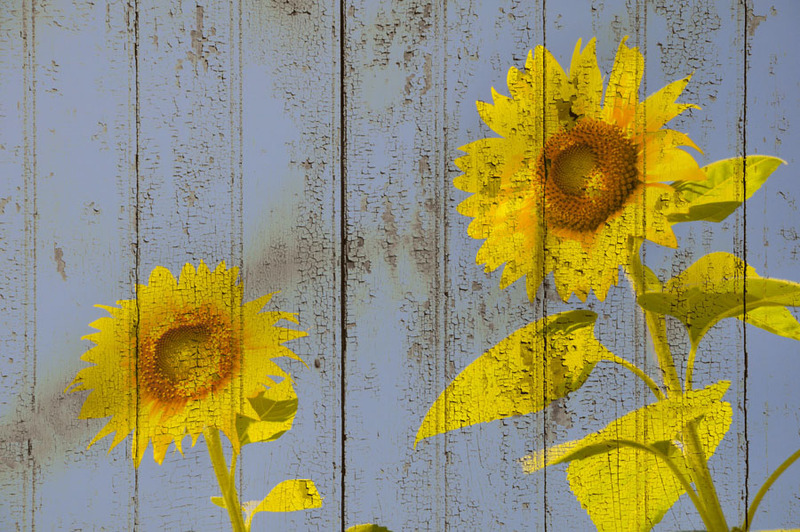 I keep fantasizing that maybe someone will come along and liven up one of those old buildings in Spruceton Valley in the Catsksills by painting sunflowers like this on it. Anyhow, please tell me: Which of these two versions do you prefer, and why? I’d love to hear from you.